While waiting to watch the depressing South Africa / Uruguay match on Wednesday we had a quick bite to eat at an American diner-like restaurant called Dodge City Diner in the V&A Waterfront. Don't you just love this little table-jukebox? It takes R2 and R5 coins which will play 1 and 3 songs respectively. Unfortunately we had absolutely no change so I can't say how well it worked. We'll however definitely be back to try it out! Posted in General and tagged restaurant on Friday, 18 June, 2010 by Paul. Really great picture guys! Pleased that you enjoyed your visit to the DCD and hope to host some time again in the future. Please note that the mini Jukeboxes are part of what was once a working system 7 single system (would give poor sound quality & therefore no longer suitable). 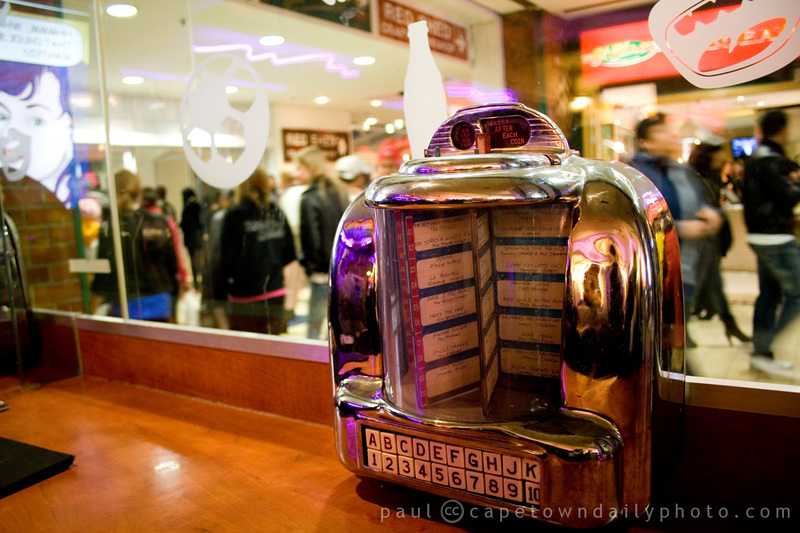 The mini-Jukeboxes are only decorative and do not link to the large Jukebox in the store. Not to worry if you had put money into the system – we do refund.